Meeting his mom and getting her to like you can be a scary part of getting close to someone new, but winning her over is possible. With a few key strategies in your back pocket, you can easily endear yourself to your guy’s mom. Even shy people like to talk about themselves when asked directly, so if you make a point of drawing her into a conversation, the bonding process will be much easier. “Asking her about herself lets her know you’re not a self-centered person and that you’re a team player. This is especially important in a family setting where you’re not the only important woman in his life,” explains relationship expert and author April Masini of AskApril.com. 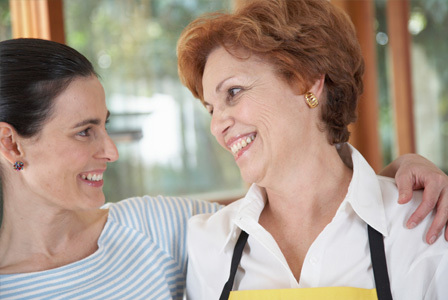 It’s not always easy to get to know a significant other’s mom, but asking thoughtful questions and listening well go a long way toward building a rapport. If you’re stuck on what to talk about, you can always ask questions about what your guy was like as a child — moms love to share funny stories about their sons. Even though you might be nervous (if this is a first visit), resist the urge to sit back and let your boyfriend do all the talking. You’re here so she can get to know you, not just as an accessory to her son. “Showing effort is a sign of respect. It’s also a signal to his mother that you’re not a lazy person, which means your character is good,” says Masini. Speak up, ask questions, and look interested even if you’re not. And most importantly, smile. A friendly demeanor will make you seem more relaxed than you are. While she may not let you help with the dishes or dinner prep, it’s always a good idea to at least offer your services. It’s a polite gesture and one that will help endear you to her. “By offering to help serve, clear, chop or clean up, you’re letting her know that you appreciate her efforts,” affirms Masini. “This goes a long way towards building the type of intimacy you can have with a healthy mother-in-law relationship in the future.” But do ask and never assume it’s OK to stand up and clear the table or start washing up without being asked — you don’t want to overstep your bounds. Flattery will get you everywhere, as long as the compliment you’re giving is genuine and doesn’t come across as too eager. Find something you really like about her home (the wallpaper in the guest bathroom, her taste in art) and let her know how you feel. Complimenting something specific, rather than generic, can also help spark conversation. In general, compliments will usually help your cause. “If you have good manners, as evidenced by appropriate compliments, she can show you off to her friends and extended family and your good grace reflects on her,” Masini explains. The more you can endear yourself to his mom now, the better off you’ll be in the long run. There’s no need to buy something extravagant but ask your boyfriend what his mom likes (her favorite flowers, her go-to bottle of wine) and make sure you don’t show up empty handed. “Bringing her a gift that is appropriate shows you understand socializing and will reflect well on your own social circle,” notes Masini. “By simply showing her that you understand that manners and societal rules like bringing a hostess gift and showing your appreciation with material tokens, you’ve telegraphed your upbringing and your social IQ, making you a valuable potential daughter-in-law,” she explains. A few days after having dinner with his parents, follow up with a thank you email or note. It doesn’t need to be long, but do let her know you enjoyed the apple pie and her hospitality and you hope you spend more time getting to know her soon.